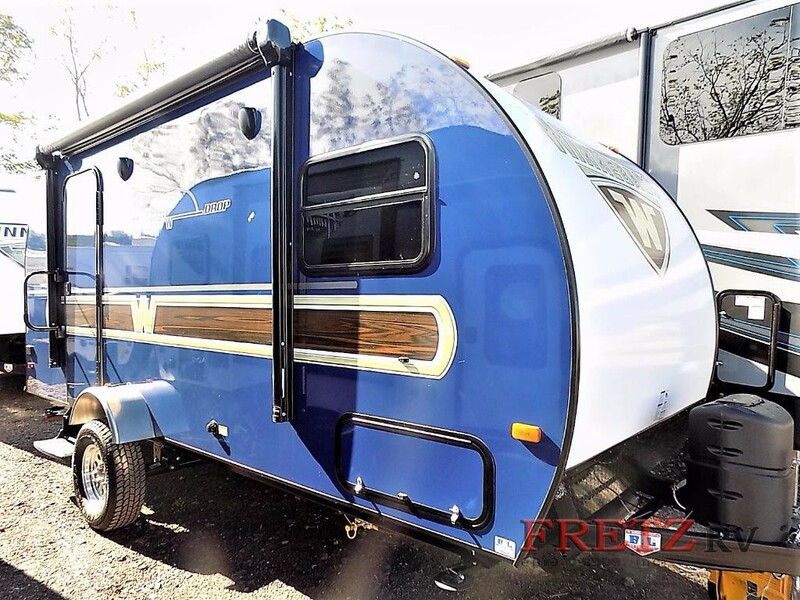 If you’re looking for a towable that has enough room for a family of four and comes with all the amenities to make a road trip fun for everyone, we’ve got the unit for you! This model just so happens to be one of the most exciting new RVs that has come out this year, the Winnie Drop by Winnebago. The look of the new Winnebago Winnie Drop is a revamping of the first trailer from the brand, dating back to the 1950s. From the colors to the stripes, it would be hard to not reminisce about camping in the RV as a kid. However, don’t let the retro feels fool you, while it may have the look of the original Winnebago, the Winnie Drop has all the modern conveniences RVers enjoy and Winnebago continues to advance on. Most of the floorplans for this lightweight trailer comes with a slide-out, adding extra space for living. You will save even more on your trips because there’s a kitchen with refrigerator, two burner cook-top, and a sink. Get more family time with meals around the table, such as the U-shaped dinette in the 1780 option. There’s also the convenience of having on board bathroom facilities. While there are slight variations between Winnie Drop floorplans, they all come with the advantage of being easy to pull. Because of that, you can pull it anywhere you’re trying to go. During the perfect weather, it’s a great opportunity to sit outside under the awning, and on the 170K model, you get the bonus of pull-out sink and double burners! With payments as low as $136/month for this teardrop trailer, there has never been a better time to upgrade your camping trips.